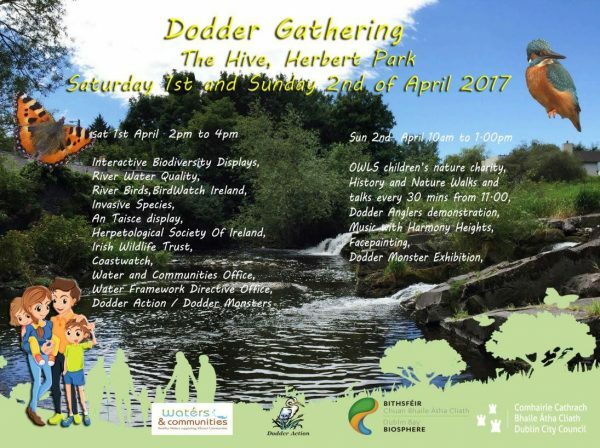 Dublin City Council are hosting an event at the Hive in Herbert Park this Saturday and Sunday in conjunction with Dodder Action. From 2pm to 4pm on Saturday, a range of wildlife experts, scientists and environmental experts from DCC Parks Department, BirdWatch Ireland and the Irish Wildlife Trust amongst others, will host interactive displays for the public. Visitors will be able to learn about river birds, freshwater insects, invasive alien species, responsible ownership of exotic pets and wildlife on the Dodder. And Dodder Action will show children of all ages how to make “Dodder Monsters” out of materials that would otherwise end up as litter in the river. On Sunday from 10am to 1pm there will be a morning of family friendly activities, including a walk along the river and pond with children’s nature charity OWLS (suitable for families with young children), historic and wildlife walks, fly casting demonstrations, creating Dodder Monsters with Dodder Action, face painting and live music. All are welcome to turn up on the day and no booking is required.